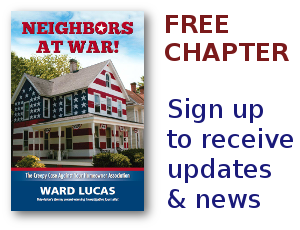 Gilead Ridge Homeowners Association Archives - Neighbors at War! 2 Comments on HOA Burglars! I guess we learn things all the time and this one is interesting. It’s a paper published in the University of Cincinnati Law Review about the 2008-2009 mortgage meltdown. Lending institutions are way behind on dealing with all the foreclosed properties. They’ve hired property management companies to help deal with the overload. Now there’s been a rash of lawsuits by homeowners late on their payments who’ve come back to find that their homes have been trashed and their personal property stolen. Seems it’s being done by these third-party contractors hired by the mortgage companies. No Comments on Sometimes,the Good Guy Wins! Florida’s Jan Bergemman is one of the early heroes of the homeowners’ rights movement. For many years, he’s had his sights set on putting rules in place that would stop the mindless unregulated tyranny in Homeowners Associations. Jan describes himself as a “retired chef from Germany.” But he’s worked tirelessly in his state to try to wake people up to the organized crime syndicate behind the Homeowners Association Movement. The Dearth of Common Sense! 1 Comment on The Dearth of Common Sense! Somehow, you’d think some semblance of that wisdom would get through to some of the 335,000 Homeowners Associations in our country, especially those who’ve been well-described as “the lawn nazis” or the “condo commandos”. In many such neighborhoods people don’t talk to each other or have folks over for dinner. Maybe that’s why so many state legislators are beginning to pay attention and talk about enacting laws to tap down the “little hitlers’ who seem to enjoy causing pain and distress among their neighbors. 1 Comment on Sign The Petition, Dummy!